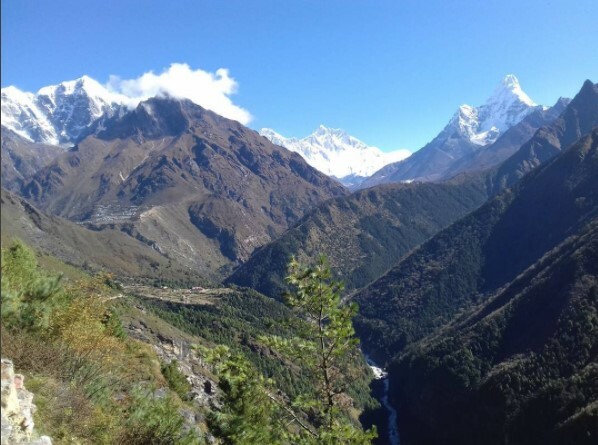 Everest base camp trek is a great introductory lodge trek that offers sensational mountain views and an insight into the lives of the Sherpa people. After exploring the temples, shrines, bazaars and restaurants of Kathmandu we take an exciting mountain flight to Lukla and trek up the Dudh Kosi Valley, surrounded by the soaring peaks of Thamserku and Kusum Kanguru. It’s a steep ascent to Namche Bazaar, capital of the Kumbu Sherpas, where we are again greeted by spectacular mountain vistas. A rest day here aids acclimatization and there are great optional walks to enjoy the area. We then follow the trail to famous Tengboche, located high on a ridge where a magnificent 360-degree panorama awaits. The views of Everest, the Lhotse-Nuptse Wall, Ama Dablam and Kantega dominate this peaceful and spiritual location – surely one of the most tranquil and inspiring places in the world. While passing Buddhist monasteries, views of Everest get closer every day. This stunning trek visits both, Everest base camp and KalaPatthar (5555m), a viewpoint recognised as the best vantage point to see Mount Everest which is a premier goal for many adventurous walkers in the Himalayas. After trekking to base camp and Kalapatthar we return at our leisurely pace back to Namche and Lukla for our return flight to Kathmandu. For the more adventurous trekkers you have the option of returning over the Cho La pass to the Gokyo valley, and then ascending Gokyo Ri. Or if you are really fit, you can attempt the summit of Island peak. These types of departure are best suited to couples, families, charity and small groups of friends. Customized itineraries are available as per your travel need. Day 01: Arrive at Tribhuvan International airport (1345meters). Overnight at Hotel. Day 02: Short briefing about trek with guide. Day 03: Fly to Tenzing and Hillary Airport in Lukla (2804 meters) from Kathmandu, trek to Phakding (2610 meters) 3 hours. Overnight at Guesthouse. Day 11: Hike up to Kalapatthar (5555 meters) early in the morning then trek down to Periche (4200 meters). 7 hours. Overnight at Guesthouse. Day 12: Trek to Namche Bazaar (3441 meters) 6 hours. Overnight at Guesthouse. Day 13: Trek to Lukla (2804 meters) 6 hours. Overnight at Guesthouse. Day 14: Flight from Lukla to Kathmandu in the morning. Overnight at hotel. Day 15: Leisure day and farewell dinner in Kathmandu Overnight at hotel. Day 16: Transfer to the international airport for your final flight departure.